We have further shortlisted the Top 3 out of Top 10 BI tools for Small and Medium Businesses. When it comes to business, essential needs include the management, storage, and analysis of business data. For example, a 6 or 7-month-old organization faces an issue that requires the details of the first project they worked on. Now the hassle is to go through all the documents, spreadsheets, make their reports, and gather all the relevant information spread in the computer files. This can be a long, time and energy consuming task. However, the organization has another option, a tool that can sort all these issues, and retrieve, analyze, transform and report all the relevant data. These software applications are known as business intelligence tools. There is a myth about these tools that they are made for the large organizations only, however, I believe the above example would be enough to clear the myth. All businesses, either small or large, require these tools to help them maintain their records and analyze the data easily, whenever they need. On the basis of this evaluation criteria, we further evaluated the top 10 tools and finally came up with best 3 BI tools for small businesses. 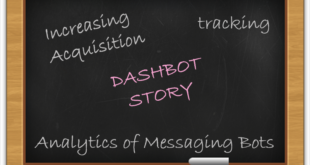 These three tools are Tableau, TIBCO Spotfire, and Pentaho. The tableau is an American company, established in California in 2003. Tableau offers a business intelligence tool that provides all the core features of a BI system. The tool is an intuitive BI system that makes it easy for the users to understand and work with. Anyone can easily connect with the data or create visual reports. This simple platform is similar to any Excel program, however, it is richer in features with shareable dashboards, interactive reports, and scalability. The tool provides a high-speed transformation of data into visual interpretations. Easy data import from several different sources and the data blend capability helps the user to build an analysis of the important data from all these sources. Easy to use and easy to customize, also provides a very active community forum. Some of the reviews of Tableau pointed out that the tool shows slow performance while dealing with the query of large data. The tool has a lack of a unified view of the entire reports along with the analysis results. Users are restricted to customize some of the specific features of the tool as the SDK cannot be modified. TIBCO Spotfire is a BI tool that focuses on providing integrated and synchronized big data that can be easily consumed and understood. Spotfire is specially made for enabling organizations to perform simple analysis in real time and that is the reason this tool is suitable for everyone rather bounding to the enterprises only. Advanced visualization with powerful and versatile customization along with custom expression. The ability to transform and align the data imported from different sources, and getting the insights. Spotfire provides a wide range of formulae that enable the high level of customization and flexibility to build the visualizations or logics. The graphical reports do not contain stack bars along with the lines in combination charts. Data transformation aligned from different sources cannot be changed after implementation. In case, one wants to make any kind of change, the entire table would have to change for that. Some user reviews tell that there are multiple bugs in the tool, and they faced the problems, like sudden shutdown. 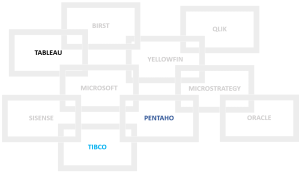 Pentaho is an open source BI tool that was founded in the year 2004. The tool focuses on the needs of small businesses and helps them to make data-driven decisions by providing features, like data integration and analysis. The tool also offers a platform to extract, transform and load (ETL), big data integration and analysis, visualizations, dashboards, reporting, data mining and predictive analytics. Easy to understand and easy to get the visualized data reports. From Excel to Hadoop, Pentaho makes it very easy to collect the data from these different sources and present them on one platform. Fast reporting, detailed visualization, infographics, and seamless integration. Some user reviews tell that the metadata layer of the tool is complicated to use/understand and the documents provided are also not so useful sometimes. No perpetual licensing available, meaning the users has to buy the tool every year at the same price. There is a huge list of the BI tools available in the market, however, the questions arrive that how many of them gives the features and facilities required by a small organization. These 3 tools are at the top of the list of those which are specially made for fulfilling these small business needs and do not contain any extra feature that only giants would want. All of these tools are made for small business, however, the unique requirements of the businesses can differ and so will their choices. If you are looking for a cheap BI solution with all core and basic business intelligence features, then you can opt for Tableau that is available at $500 for a yearly subscription. The standout feature of the tool is its ability to integrate with social networks, which can be a great advantage to your business. 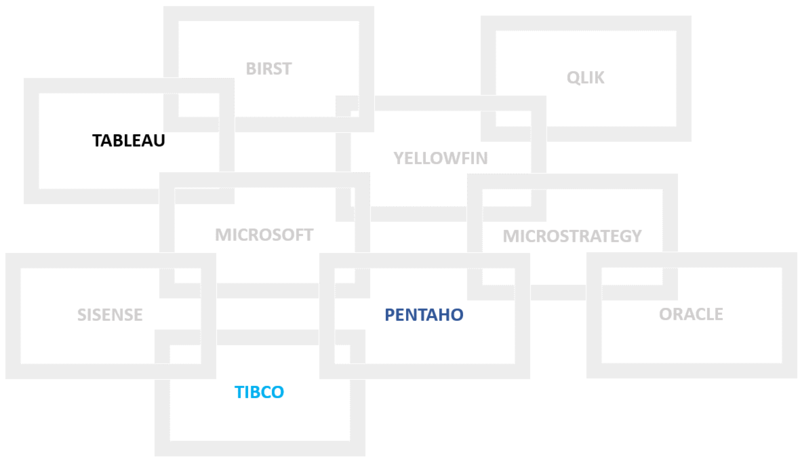 Other than Tableau, Pentaho is also a good option for cheap and complete BI solution. Pentaho is easy to use tool that would be very handy for you. This tool also provides a seamless integration with social media networks and offers a fast reporting, and detailed visualization features. The third tool can be a little bit expensive in comparison with others, however, the tool works perfectly for small organizations. It is made to provide simplicity to the difficult task in terms of business intelligence and offers an all kind of data analysis in real time.